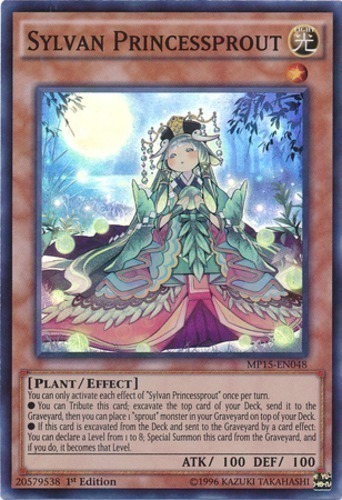 You can only activate each effect of "Sylvan Princessprout" once per turn. ● You can Tribute this card; excavate the top card of your Deck, send it to the Graveyard, then you can place 1 "sprout" monster in your Graveyard on top of your Deck. ● If this card is excavated from the Deck and sent to the Graveyard by a card effect: You can declare a Level from 1 to 8; Special Summon this card from the Graveyard, and if you do, it becomes that Level.